Description: Do you dream of having a small place in the woods that can be built practically for free? The Forest House with its striking pyramid roof is made almost entirely of natural products that are readily available in tropical forests – wood poles, bamboo and thatch. Recycled doors, cabinets, sink, composting toilet, solar shower and other materials, plus building on a hillside keep costs to a minimum. Consider leasing the land or work-trade agreement. Features include steeply pitched roof to shed rain, open ceiling to improve ventilation, built-in desk, retractable plank and metal barriers on each post to deter pests. Options include under-bed storage, mosquito bed net, split bamboo (shown) or bamboo matt, split bamboo or wood plank floors, rustic curved wood railings. Building permit not required. High speed Internet not included. No high speed internet is a deal breaker for me. It was for me too. I considered building this six years ago. That’s when I designed it. But the isolation and lack of services was too much to bear. nice….this would be perfect for the tropics. owen do you have a more detailed plan for this structure? This is bigger, more sturdy, and less expensive than a tent. 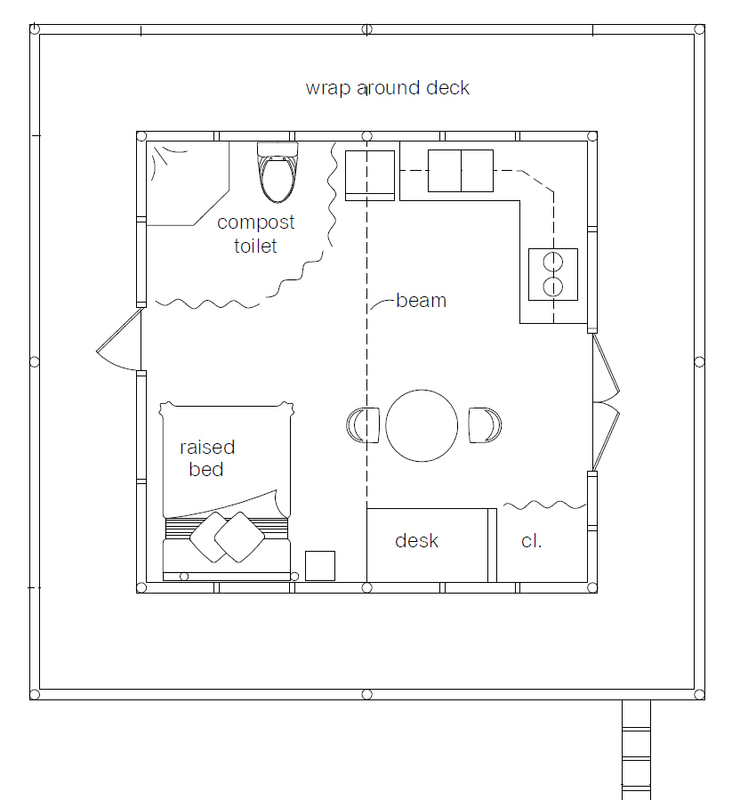 Well one with the same square footage anyway. A little landscaping, a fishpond and the odd Oubliette…I could be happy for 50 or so years. Thank you Owen. That’s a good point comparing it to a tent. Hadn’t thought of that. Tents are expensive, even army surplus. 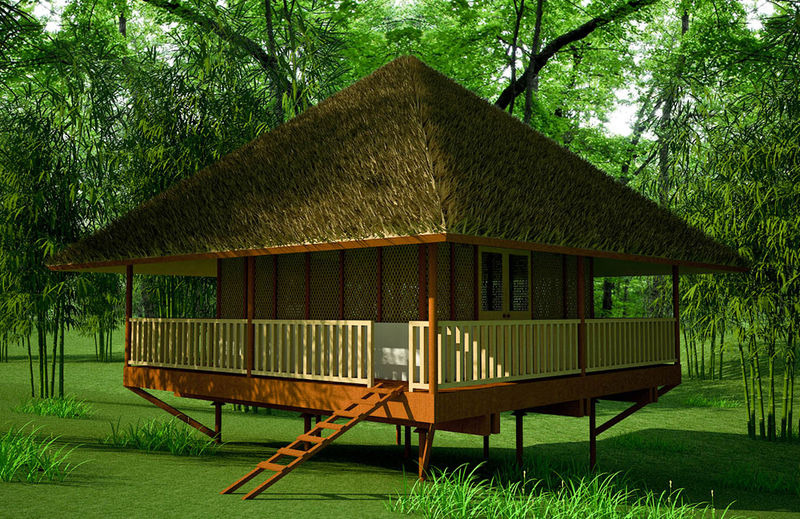 Plus, the Forest House gets you up off the ground away from heavy rain and creepy crawlies. Another big plus is the wrap-around porch that would make enduring the rainy season a lot easier. You could walk around the house, exercise, have friends over, set up easy chairs, read, etc. all out of the rain. Just imagine the fresh air and good smell. A few other comments/benefits: choose a fertile area where fruit, vegetables, corn, rice, beans, etc. are abundant and low cost, avoid super hot, humid areas with too much rain, don’t build in the path of future logging operations, work toward gaining local support by helping the the community, be prepared and willing to move on if things don’t work out for some reason. No big deal if you have to move if you’ve only spent a few hundred dollars ($1,000 tops if you buy everything instead of harvesting local materials yourself) and lived rent free for a few years or so. Also note, satellite Internet is available almost everywhere now. I know people who live or spend time in remote areas. They have a special attachment/modem for picking up satellite signals. where is the link to your paypal to get the plans for this house.. I like it…I like it alot. This is great. Looks like a Filipino nipa hut. Burying the poles in the ground (pier foundation) is probably the best method for building on a hillside. There are various ways of doing this. Check with local builders and see what’s used in your area. Are you building on flat ground? Then you can use piers or earthbag (gravel bag) foundations. Search our earthbag sites for details. I’ve never worked with coconut wood, although I’ve heard it can be used if you are skilled and selective. Again, get advice from local professionals who have experience with coconut wood in your area. The quality may vary a lot. wonderful!it’s not exaggeration to say this is spell bound. I would like more information and building plans. Seen a lot of things similar to this in the North of Thailand and Cambodia. The families generally fence off the lower part to corral their pigs and chickens at night, and the occasional water buffalo. But in Thailand they still use a lot of teak wood for the main beams and supports. Stayed in one for a while it was very nice. Also it keeps the snakes out being set up high. Thanks for writing. Recycled wood is very popular in Thailand. Not sure what kind it is. The wood lasts a very long time. (The hardwood used a long time ago – not the new stuff.) We have some posts about 3 meters long and I was told they’re worth $100 each (3,000 baht). They’re probably 100 years old. Judging by the notches, they’ve been used on two previous houses. Now they’re going into another house and we hope they’ll last another 100 years. I like this design..but can u tell me how the sanitation work on this house..?? It uses a humanure composting toilet (sawdust toilet) like Joseph Jenkins. Greywater drains onto the ground or into a trench or pit. Hello: I am thinking of building a few of these in the mountain areas of a Caribbean island for agrotourism. Are the roofs strong enough to withstand hurricanes? Is there a more sturdy, ecofriendly material you would recommend? and most builders I know there are ignorant of ecobuilding construction. Do you do consults? Almost nothing will withstand the direct hit of a hurricane. I know because right now I’m in the Tacloban/Ormoc City area that got hit by Typhoon Yolanda. Some concrete buildings survived, some got blown apart. Even steel structures got twisted into spaghetti. Even the roads are badly damaged. Philippine architects understand the principles and are starting to build large scale earthbag housing developments. Search our Natural Building Blog for the story on earthbag houses in Coron, Palawan, Philippines. I recommend using crushed limestone or crushed coral pounded into earthbags to create 18″ wide walls. Round one-story shapes are strongest because the wind will blow around the building instead of building up pressure. Pound 1/2″ rebar down through the bags. Add a reinforced concrete bond beam as explained in my ebook with strong hurricane ties embedded in the concrete. Fasten the roof members to the hurricane ties. Build strong shutters to close off doors and windows. Cover the walls with cement plaster. Those are the basics. You should be able to figure things out from there by consulting with local builders and following my ebook and YouTube videos and/or getting my DVD. But if not, I’m available for consulting at $50/hour. This little forest cabin looks amazing, I love the idea of using on-site natural resources like trees as your building materials. Reminiscent of the early days of humanity. Owen, could this be made to be earthquake safe? I’m thinking of Costa Rica, 10 degrees north of the equator, significant earthquake potential (and lots of rain and hot weather). Sure. That’s my email where I answer questions every day. You can order it direct from me using PayPal.